When a natural disaster is coming, it's essential to have lifesaving plans in place — including for your animal family members. Knowing the law is an important part of planning. This is an overview of the key federal law that affects companion animals in a natural disaster: The Pet Evacuation and Transportation Standards Act, better known as the PETS Act. The PETS Act is a federal law that was passed in 2006 shortly after Hurricane Katrina. In order for states, cities, and counties to receive federal funding for their disaster relief plans, those plans must “account for the needs of individuals with household pets and service animals before, during, and following a major disaster or emergency.” Since then, more than 30 states have amended their disaster relief plans to account for the needs of companion animals and service animals. The Act allows the Federal Emergency Management Agency (FEMA) to provide funding to states and localities for the creation, operation, and maintenance of pet-friendly emergency shelters, along with other emergency preparedness actions for companion and service animals. FEMA is also permitted to reimburse state and local governments for rescuing, caring for, and sheltering animals in an emergency. It’s important to know what the PETS Act does, as well as what the law doesn’t do. Frequently, misinformation will spread about what the PETS Act does and does not require. For example, one common — and incorrect — assertion that is regularly shared on social media is that the law requires hotels and motels to accept evacuees’ companion animals. This is not the case. Hotels and motels are not required to accept animals. This misconception is so common, and so wrong, that FEMA has addressed it on the “rumors” section of its website. Because of the PETS Act, it’s more likely your community has an emergency shelter that can accommodate companion animals. Find out where that shelter is before the disaster or emergency hits. And also be sure you find out what will be required of you and your animals to stay there. For instance, it’s often required that you provide proof that your animals are licensed and vaccinated. You may also need to bring a crate and food with you. What is the background of the PETS Act? The PETS Act was passed in 2006, largely because of what’s seen as the failures to protect animals, and families with animals, in Hurricane Katrina. There was lack of animal-friendly emergency shelters in areas affected by the hurricane, and emergency plans did not account for animal family members. Because of this, many in harm’s way decided not to evacuate, and instead stayed in place, keeping themselves and their families in harm’s way due to the dearth of options for their animals. A 2006 poll found that in fact 44 % of people who did not evacuate for Katrina made that choice because of their companion animals. Those who tried to evacuate with their companion animals were faced often faced with terrible choices, too. Many people separated from their animals did so unwillingly. No one can forget the heartbreaking accounts of people fleeing Katrina who brought their dogs and cats with them to evacuation buses, only to be told by officials they must leave the animals behind. It’s estimated that as many as 100,000 companion animals were separated from their families during and after the storm, with perhaps 70,000 of those dying. No one wanted to see those figures, and those tragic stories, repeated when another disaster struck. Where does the law need improvement? The PETS Act is widely cheered as a major step forward in how companion animals are treated, and protected, during hurricanes and other disasters. The PETS Act only provides for certain companion animals — namely service animals and those that FEMA calls “household pets.” This is a relatively small category of animals, including dogs, cats, birds, rabbits, rodents, and turtles. But the category excludes reptiles other than turtles, fish, amphibians, farmed animals, horses, and others. This law should be expanded to provide protections for more animals. 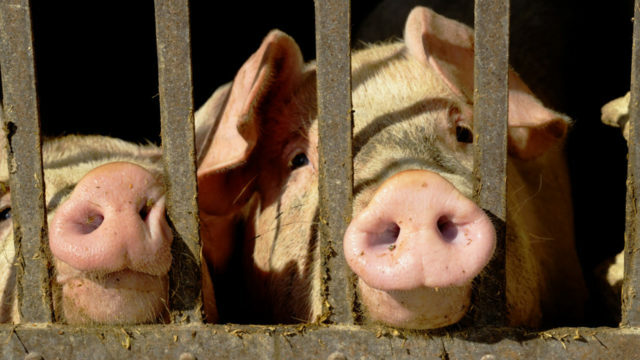 There are no laws protecting farmed animals in emergencies or natural disasters. Some 9 million pigs, for example, were at risk when Hurricane Florence hit the Carolinas in 2018 — with some of the worst damage coming in areas that are heavy with factory farming. No laws required farmers to have a contingency plan in place to even consider the welfare of those millions of pigs, let alone requiring them to move those animals to safety. Animals in zoos are also at risk. Zoos accredited by the Association of Zoos and Aquariums, a nongovernmental organization, are required to have disaster plans in place. Smaller zoos and roadside menageries are a different story. They are required to have plans in place under the Animal Welfare Act (AWA) — the federal law setting minimum standards for zoos and other animal facilities — but enforcement is subpar. Additionally, there are real concerns about whether these smaller facilities have the money and staff to clean up and make repairs, once the disaster passes. Indeed, during Hurricane Irma, two African antelopes died at Florida’s Naples Zoo. A tree frog, a toucan-like bird named Aracari and an otter named Rudder died at the Palm Beach Zoo, another small Florida facility. Even with the PETS Act, the execution needs enhancements. While pet-friendly emergency shelters are more common now than they were when Hurricane Katrina hit, there are still communities with no accommodations for companion animals. More animal-friendly shelters are needed, in more communities. This is critical in order to ensure the safety of companion animals — and of the people who will put themselves in harm’s way if they have no way to get these beloved animal family members to safety.